Weight Watchers is Changing EVERYTHING in 2019! 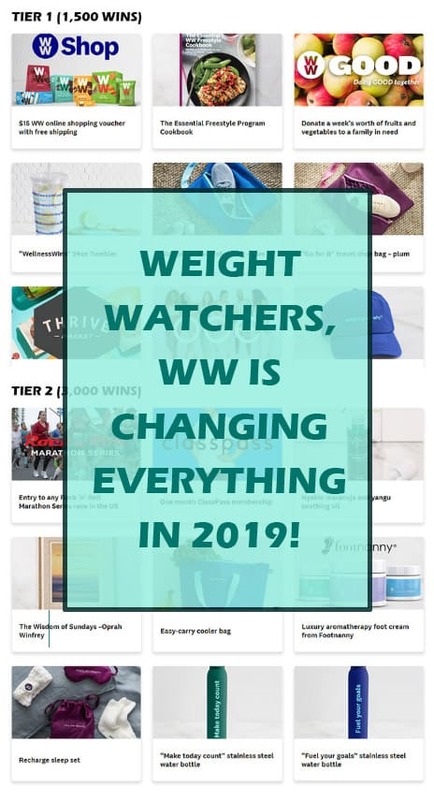 If you have been a member of Weight Watchers, or WW as they rebranded themselves last September, then you might have already heard that WW is planning on changing everything about themselves in 2019. OK, so maybe “everything” is a bit of an exaggeration, but not much. Yes, you can still focus on losing weight or maintaining your weight and SmartPoints still apply, but those are about the only things that aren’t changing. First, Weight Watchers, who last year decided to trim down to just WW, is going to start using those initials to mean Wellness Works. It takes a little while to adjust to these new names, but honestly, we would rather attend a Workshop with a Wellness Coach than a weigh-in with a leader! Some might say that it’s just semantics, but let’s face it, semantics matter! Being called overweight is preferable to being called fat-so, right? The whole idea here is that living a healthy life means you can reap the benefits of the best possible life and your weight is only a small part of the whole picture. In fact, for those who attend Wellness Check Ins, you don’t have to weight in if your weight is not an issue. People can talk about the things that matter to them, such as how they added more vegetables to their diets without trying or how meditation has helped them destress. Some people cringe at the new-ageyness sound of the world “wellness”, but when you think about it, it’s a good word since it encompasses so much of our health. Imagine talking about how you can bring down your high cholesterol numbers if you are diabetic or perhaps you would want to focus on lowering your blood pressure. Wellness really does matter and it is a huge area that encompasses much more than weight. WellnessWins Prizes - Who doesn’t love winning prizes?! You get credit for doing even basic things such as logging your meals every day and working out. Prizes include fitness gear, clothing, even a subscription to Rent the Runway! Headspace - Mental health is just as important as physical health and we are so glad that WW is addressing this area. They have partnered with Headspace, which is a mindfulness meditation app that you can tune into as a part of your membership. Connect Groups - This is far better than Facebook! This feature allows you to find members in your area that have similar interests, so you can make friends and have someone you can talk to that understands your lifestyle. So, whether you are a 60-year old grandmother in love with gardening or a 20-something year old with a new baby, you can find like-minded people who are also into WW. Fitpoints - This used to be a one size fits all program and we are glad it is changing. There is simply no way that a 60-minute spin class should be worth the same 8 Fitpoints as a 60-minute walk. Now Fitpoints will vary depending on the workout, your age, height, gender, etc. You can exchange Fitpoints for extra food points if you like. There are more rewards and partnerships, including gift certificates from Kohl’s, ClassPass membership, and Footnanny products. WW leaders say that years of experience and research have gone into these changes. They have found that there is power and significance in making small, everyday behavior changes on a long-term basis. One pilot program found that users had increased engagement and more satisfaction with the program than members who stuck with the original platform. WW is a global company that wants to focus on both wellness and weight management by adopting healthy habits that work in real life. We think that WW is on the right track, even if it will take us some time to stop calling it Weight Watchers.